Colliers International is one of the “big five” global commercial real estate agencies (the others being CBRE, JLL, C&W, Savills), currently trading at a discounted valuation due to uncertainty about the near-term outlook for commercial real estate and recent CEO change. We believe that Colliers is an extraordinary business trading an ordinary valuation multiple. The company is listed on the NASDAQ and on the Toronto stock exchange. In this article we refer to the US listed shares and all amounts are in US Dollars. Geographically the company is concentrated in North America but growing more quickly in other markets and becoming less US-centric. Colliers has a stellar business and long secular growth opportunities, as the commercial real estate (CRE) market outside of North America is incredibly fragmented leading to many opportunities for growth via acquisition. The commercial real estate business is durable, at minimal risk of technological obsolescence (each lease or sale is individually negotiated, and the commission amounts are trivial compared to the transaction values), and largely fragmented outside of North America, which means that the industry leading companies can continue to grow through consolidation for years to come. In the industry, we like Colliers to the most, due to the strength of its management team and excellent history of capital allocation. Colliers has a moat – a durable competitive advantage. This is evident from the company’s sustained high return on invested capital (over 15% each year during the past decade). Colliers operates in an industry were reputation, relationships and scale matter more than price. The commissions earned by Colliers are tiny compared to the mammoth transaction sizes in most real estate projects, and the end market itself is price insensitive. What we mean by this is that cutting real estate commissions by 20% does not result in more business – in fact that matters to sellers / buyers is their outlook on the CRE market, availability of financing, etc., not the fees charged by Colliers or their competitors. Colliers is a global franchise, the fourth largest CRE company in the world – a business that took decades to build and one that can’t be easily replicated. This is a fee-based service business that does not require CapEx to grow. All profits can be returned to shareholders or used for acquisitions. The company has compounded shareholder value by 16% for over 20 years now, despite operating in what is a traditionally very cyclical industry. Colliers operates in an enormous industry ($160 billion USD, 2017), that is still highly fragmented. The top 5 firms account for less than 20% of sales. For comparison, the top five global accounting firms generate approximately 75% of industry revenue. Colliers currently has less than 2% of the total addressable market, and the market itself should grow in line with the value of CRE globally. 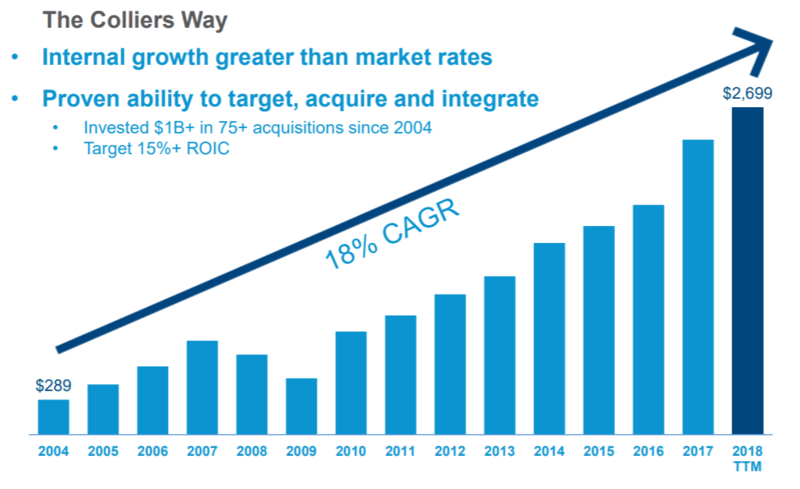 Historically growth has been balanced between acquisitions (2/3) and internal growth (1/3). The company has a multi-decade consolidation opportunity ahead of it and has deployed over $600 million in acquisitions over the last 12 months. The latest acquisition to close was announced on January 4th, 2019 and encompassed four offices in the Mid-Atlantic Region with 340 real estate professionals. Of note is the company’s acquisition strategy which Colliers calls the “partnership model”. Other brokers (JLL, CBRE, etc) favor bolt-on acquisitions of entire real estate teams. Colliers on the other hand, instead of acquiring 100% of a smaller brokerage favors acquiring a controlling interest and allowing the former management to retain a minority interest (20-30%). Colliers also acquires a call option on this minority interest. This call option allows the company to acquire the remaining interest at a pre-approved multiple at any time in the future. This minority interest is carried on the B/S as “redeemable non-controlling interests” and totaled $335 million as of Q3 2018. We believe this form of “partnering” with targets improves broker retention and productivity. This approach provides Colliers a competitive advantage when seeking to close deals. We believe that Colliers’ corporate culture remains highly entrepreneurial reflecting the character of the founder, Jay Hennick, who only recently stepped down as CEO and owns more than 10% of the company. Colliers has demonstrated excellent capital allocation in the past – it has been rational and logical given the company’s opportunity set. We believe that given the fragmented nature of its end market, the best use of the company’s capital is aggressive expansion through continued acquisitions. The company continues to do so with thirteen deals announced or closed in 2018. Anytime a company pursues growth through acquisitions it can be a dangerous strategy as it is easy to overpay and destroy shareholder value. It is therefore imperative that management own a large share in the company, and that is the case with Colliers. Management and insiders own over 20% of outstanding shares. We believe this is sufficient protection to guard against doing deals for deals sake. Colliers has also shown that it cares about maximizing shareholder value. In 2015, the company spun off FirstService (FSV), it’s association / property management business, which has fundamentally different characteristics than the CRE business of Colliers and wasn’t being fully valued within the combined entity. The company was right to pursue the spinoff as FSV has more stable and sticky revenue which is valued more highly by the market. In summary, the company’s capital allocation is straight forward: acquire more real estate brokerages and continue to consolidate the market. The company makes heavy use of “adjusted” earnings and adjusted EBITDA. A heavy reliance on adjusted numbers is usually a red flag that must be accounted for. In the case of Colliers, the most important adjustment to earnings is the accounting treatment of minority interests. As we have stated previously the company usually acquires a controlling stake in a bolt-on acquisition with the local team retaining 20-30% shares. This creates a minority interest which is both callable and puttable to the company – usually at the same price. The strike price is calculated as a multiple of EBITDA and therefore the value of this liability is adjusted annually as the EBITDA of the underlying minority interests increases. This change in value runs through the P/L and depressed GAAP earnings. This type of accounting treatment may be conservative, but it dramatically understates the earnings power of the company, especially in years of strong organic growth. The value of the company is understated because while the liability arising from the puttable minority interest is recorded on the balance sheet and its change runs through the P/L, there is no corresponding recording on the asset side, as Colliers own majority interests in all the partnerships reflected in the minority interest. As of January 8, 2019, Colliers share price is down 30% from its recent highs, reflecting concerns about a global economic slowdown and downturn in the CRE market. Median analyst estimates for adjusted EPS are $4.57, $5.03 for 2019 and 2020, respectively. Shares are currently trading at 12.7x 2019 EPS estimates. We estimate that adjusted EBITDA is approaching a $300 million annual run rate. The company’s current Enterprise values is approximately $3,370 million. Therefore, Colliers shares are trading, under 12x EV/ adjusted EBITDA – cheap for a business with growth opportunities as large as Colliers. On December 6, 2018, Dylan Taylor (48) was named the new CEO of Real Estate Services. He has been with the company since 2009 and is a likely to successor the founder Jay Hennick. Mr. Hennick will continue in his role as Chairman. Colliers is a business with a moat, high free cash flow business model, operating in a consolidating industry. 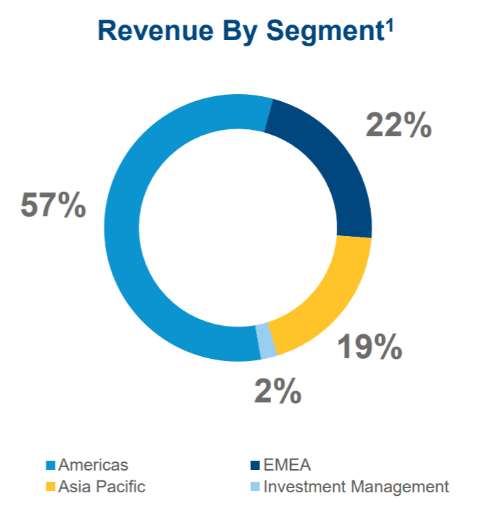 The fragmented market offers the opportunity for multi decade growth, via relatively safe and predictable bolt-on acquisitions and partnerships. Growth of 10-15% per year can continue for at least the next decade. Colliers has an owner / operator management team with high insider ownership and a good history of capital allocation. The chief risk is a major slowdown in the global CRE market driven by tightening liquidity. Secondarily, the company’s growth will slow if it cannot finding suitable acquisition targets. Shares are likely to return 15% per annum for the next decade on continued EPS growth. The current valuation is undemanding. We are long shares of Colliers (CIGI). Article by Lukasz Tomicki, fund manager, LRT Capital. Author: Lucas TomickiLukasz Tomicki is the fund manager of LRT Capital. LRT Capital Management, LLC is an independent investment manager based in Austin, TX. LRT focuses on long-term, value-oriented investing.